How fast does Customer Service need to respond? With the rise of social media and the transition to an information society, the instant response is already a rule. This is also true in the world of Customer Service, the expectation of consumers today is to have an Omnipresent Real-time Customer Service, which is Transparent, Authentic, and especially fast. 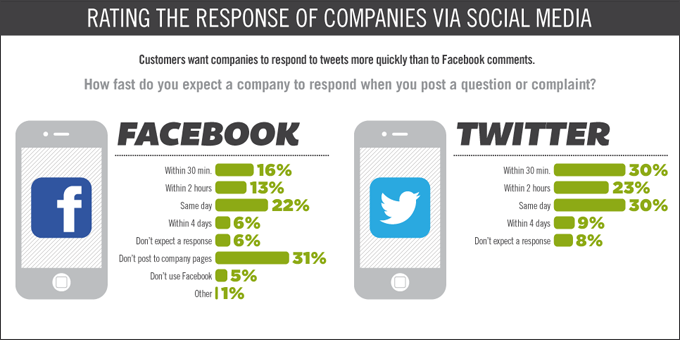 Users prefer the answer to be fast via social media, but what they prefer most is that their responses are rapid via Twitter! That’s 30% of users who want a quick answer, on average 30 minutes, compared with Customer Service via Facebook that is only 16% with the same average time. Be alert to the average time, the favorite is 30 minutes!